It has been one of those days when logging in brought, "Sugar get in X and come here." This is a good thing. Many people long for log in and receive PvP. It doesn't happen every day and I still get a little pleased thrill that people want me around. Allo said that there was a possible Drednought to tackle. He then bounced around between fleet comps. I wound up growling at him becuase I didn't have what he wanted and had to keep running and grabbing new ships. However, once the other side showed up we got ourselves together. I wound up in a Jaguar. Surprise. But we needed tackle. The story, as I got it later that day, was that 7-2 took a POS from someone a few days ago. That group came and reinforced the POS 7-2 put down. 7-2 was trying to kill their POS take down fleet. At the time, however, all I knew was that there was a POS something about something else, shooting people, Jaguar. Once settled, the scout got a warp in and we dropped in on them with a "Hello there!" they scattered. I ran down the Oracle once the Talos had a secondary point. By the time I got range on the Tornado it was dead. A second Talos also died before I could cross the distance. This is where the difference between an interceptor and assault frigate in speed is big. I would have done better, maybe, with my interceptor, but my Jaguar can handle more damage and we did not have logistics. I've recently fitted up a Dramel and I will have to try it out in some of these situations to see how it does as a bridge between the two. I then went off to the store. I had stuff to do for my packing. 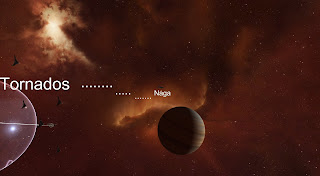 When I wandered back, four or five hours later, I logged in and Titus was calling for sniping ships. Of course, my Naga was in Bosena. 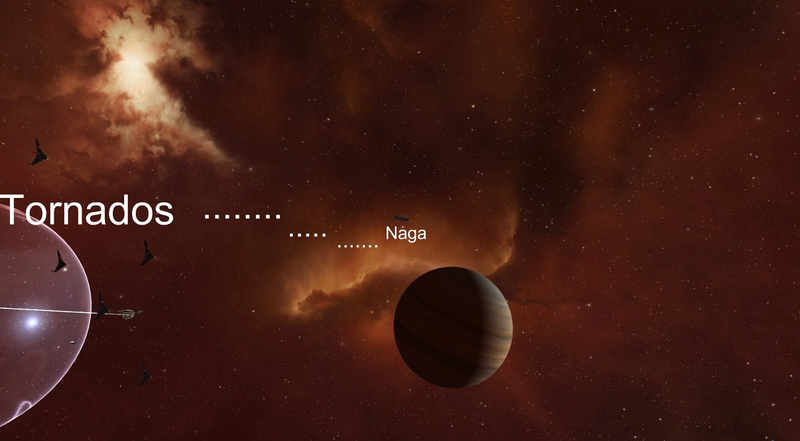 Nagas that I had gotten large guns just so I could participate in sniping fleets. Of course, in the month or two that I have had them there have been no fleet use for them. I've undocked in my Talos a few times but in general my comfort level is super low. Allo pulled a Naga out of 7-2's stuff and I paid him for it. To my delight, I could fit it without any adjustments. It is nice to no longer have to down grade things as often when someone hands me a ship. The biggest problem was that I had never flow a Naga or engaged in sniping. I've barely done kiting because the boys like brawling and that is where most of my experience is. So, uncomfortable is a good way to describe how I felt when I undocked and went to join the fleet. It is a good time to go with the flow. Listen to orders and shoot things. Never having participated in a sniping fleet the concept of being so far away from the target was very strange. I want to feel that I am not close enough. Yet, to my surprise, I lock and hit things. Yay! It works. However, I know nothing. I don't know which ammo to use. I have four, they hit at different ranges and with different damages. Everyone else is in Tornado's and cal shoot to the FCs ammo call. I'm special snowflaking it over, lagging a bit behind cuz Naga is slower than Talos, trying to make a good choice. Naga is also slower than Tornado. I had to stay on my toes to make sure I didn't get tackled. Warping in and out and up and down and around is exhausting. Align here, align there, change range, align up, align down, warp in, warp out, warp back, warp south. I wasn't sure who we were shooting, if we were defending the POS or just shooting the people shooting it, why we were shooting them and what was going on. The other fleet was mostly battleships and tackle. We managed to blap the tackle as it approached They finally called in a Revelation to finish off the tower. The FC thought that it was bait. It seemed that we didn't care a lot about the POS. So we shot the dreadnought and every time their fleet got a warp in we warped out. Our tackle was on field doing anti-tackle and spamming the dreadnought for when it came out of seige. A rear scout reported local going up. We got ready to bail and as we bailed another fleet landed. The FC stopped us and called for us to go back to shooting things. The new fleet it turned out was there to kill the fleet we were also shooting. The heavens opened up and Thanatos and a Nyx fell out. The Revelation promptly died. We promptly cleared the field of the hostile, now dreadnoguhtless fleet, warped out, warped in, and proceeded to shoot at the new people that had arrived. We lost our tackle in the middle of this but we had called in more people and people reshipped and made it to the battle. The other group put up a good fight and we kept blapping them as they came onto the field. The second fleet bailed as soon as they could and left their Megatron to us. The entire thing took a while and by the time we were done I was a tired, tired creature. All of the aligning and darting off and being called to undock before I had settled in. I now know more about snipers but precious little enough of that. My PvP abilities are all focused around brawling and being in peoples faces. It is limiting and this type of event is good. I had some range issues because of my scripts. I've never really used them before and fell into a void of figuring it out on the go. It makes me feel a bit dumb. Such a simple thing but it left me a bit frustrated and hissy from fighting with it.